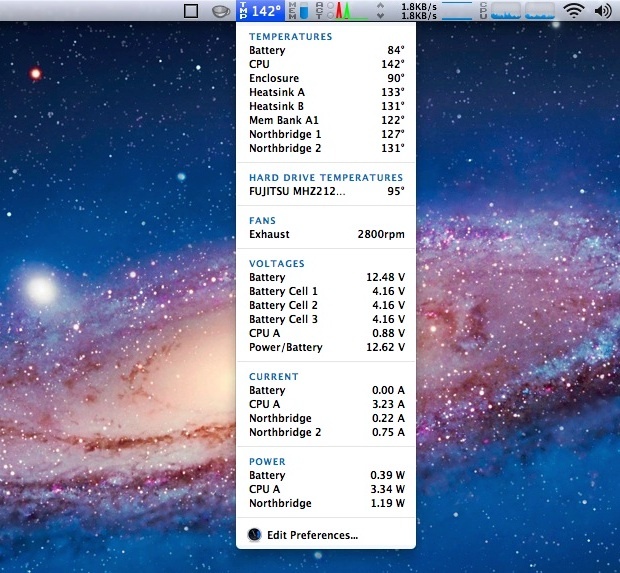 If you want to keep an eye on your Mac’s CPU temperature, you can choose between two different apps to display the temperature right in your menu bar. If you’re running Mac OS X 10.6.8 or lower, both apps are free, but if you’re on Lion then you’ll have to pay for one of the options. You’ll see that both of these apps do a lot more than just display CPU temperature, they detect and display all internal temperatures including battery, various locations on the enclosure, the heat sink, hard drive, and each CPU core. We’re going to mostly ignore that though and aim for CPU temps. Without doing that, you’ll end up with the default battery temperature displayed in the menubar because the list is alphabetized. You can also go about customizing the font in the preferences if you want. You’ll quickly notice that Temperature Monitor goes far beyond just displaying temps, and it makes a great diagnostic tool with its history, graphing, and alert features. Those abilities are beyond the scope of this article, but they go further to make this free app worth the download. We have talked about iStat 2 before as a great way to monitor system activity in the menubar, but if you tweak the settings and disable all the other stuff you can just display CPU temperatures as well. Clicking on the menubar item pulls down the menu you see up top, which shows off all the other temperature sensors. While iStats 2 can still be found for free and works with Mac OS X 10.6.8 or earlier, Mac OS X 10.7 users will need to pay $16 for iStats 3.